When you choose marble as the finishing material for your project, you’ll want to order pieces that are close to the final size you’ll require. This allows you to minimize cuts, grout lines and labor. However, the retailers you have access to on the local level are sure to have a limited selection in stock. While you might be able to make those tiles work, do you really want to wind up paying for material that will just be cut off and disposed of? A better option is to work with a supplier that is pleased to offer custom services so that you can get the size and finishes you need at a price that will fit your project’s budget. Here at Nalboor, we offer marble tiles in several shades and sizes. Choose the Adalia Cappuccino in 18” x 18” tile, or go with the Crema River in a 24” x 24” tile to create a beautiful floor. Our Rojo Alicante marble comes with a polished finish that’s perfect for use in the foyer, kitchen or other interior areas. However, we also offer custom work so that you can get the size and finish that you need. We also offer tumbled tiles that are more appropriate for any exterior applications or places where you’re worried about people slipping. We can cut the tiles smaller, provide you with beveled rather than straight edges, or give you subway tiles instead of our stock square tiles. The choices are yours, and our manufacturing professionals will provide you with professionally cut stones that suit your particular needs perfectly. One of the problems with cutting marble tiles yourself is that you likely don’t have the skill or tools to give the edges a perfectly smooth finish. This isn’t a problem when you’re cutting edge pieces and the raw finish will be under a piece of trim, but it can be a danger when you’re working with edges that will ultimately be exposed. Rather than spending extra money on the special sanders and other tools to customize your own tiles, you can allow us to take care of it for you. We have our custom tiles created at the point of origin by the same manufacturing professionals who create our regular inventory. The edges are just as straight and smooth, but you’ll have the size that you need. It’s the best way to deal with edge tiles, door thresholds, special pattern pieces and other custom items. You never know what the future holds, and you may need more of a certain tile to either expand a project or meet the needs of a new customer. While this can be a tall order for suppliers who are constantly changing manufacturers, it’s no problem for our team. We offer a more streamlined inventory because we believe in providing a consistent inventory so that you can get more of a certain color at any time and be confident that it will be as close of a color match as possible. Everybody is in business to make money, but there’s no reason for you to be at the end of a long line of markups. 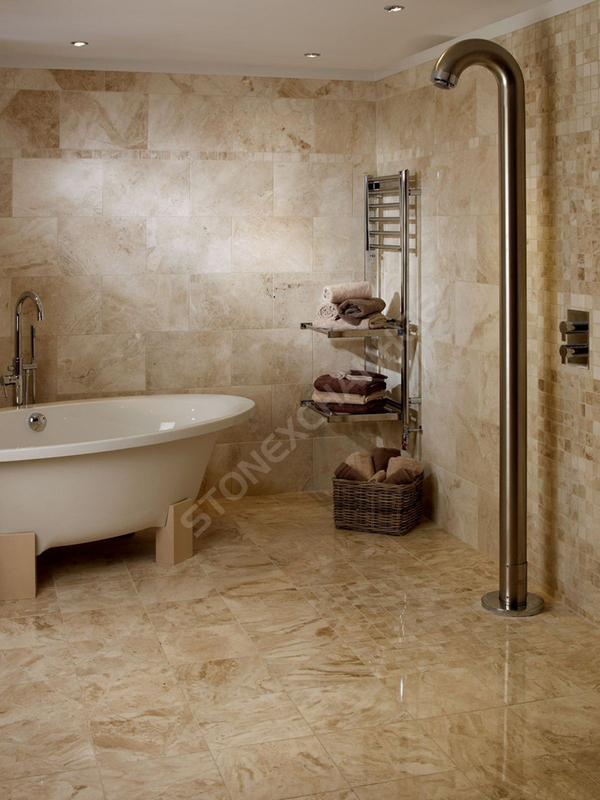 The closer you can get to the source of a product, the more money you can save, and we provide you with a way to avoid all the middlemen when you’re ready to invest in natural stone products. Rather than buying from a line of wholesalers who have been marking up the price at every turn, we simply work with our own quarries and manufacturing centers. Without any middlemen driving up the price, we’re able to provide you with fantastic rates that your local suppliers simply cannot beat. Another great advantage of eliminating the constant changes in ownership is that we’re able to maintain tight quality control standards. Everyone from our experts surveying the rocks within the ground to the final customer service representatives at our distribution center is focused on providing you with quality materials. We take great care with the products through every step of the production and delivery process. While you may find substandard items on the shelves at your local home improvement store, we work hard to ensure that every tile you receive from Nalboor will meet your expectations. We admit that a few may slip through now and again, but we’ll work closely with you to correct the problems and ensure that you’re satisfied. They say that customer service is dead, and that may be the case in some areas. However, we believe in keeping customer service alive and well. We’ll provide you with respectful and courteous service because we want you to have a great experience. When it’s time for you to buy marble for another project, we hope that you’ll remember Nalboor and allow us to serve you again. Our orders are checked twice for accuracy and we strive to complete your custom order in a timely manner. Everything is packaged with great care to minimize breakage in order to provide you with a stress-free process. With our experienced professionals, it’s all about offering our customers excellent service, quality merchandise, and fantastic prices. Custom orders are easy to place with Nalboor. All you have to do to discuss your needs and place an order is fill out this form or give us a call. We do have minimum order requirements, so you’ll want to order a full container or crate to save money. The entire process adds roughly two to three weeks to our usual turnaround time, but you’ll save time and labor on the job by having custom pieces that are cut to your specifications. You’ll save with our wholesale pricing, and you’ll benefit from our great customer service. Rather than buying typical sizes from your local store and trying to cut them yourself, go with professionally cut custom tiles that are perfect for your individual project.